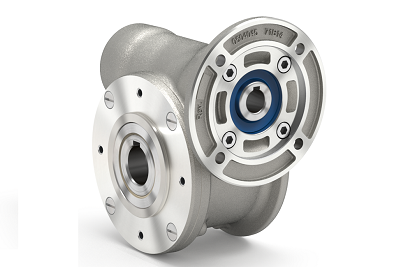 The HYDROMEC VFZ series of nano-coated aluminum worm gearboxes are characterized by the special processing of their surface. The so-called NTT TM surface treatment of the aluminum ensures extraordinary properties of the aluminum gearbox. Characteristic of the HYDROMEC VFZ gearboxes are their high corrosion resistance and long service life. They are suitable for use in many different industries. Among other things, the VFZ worm gears are ideally suited for applications in the food industry, the beverage industry as well as the fishing industry and the shipbuilding industry. The nano-coated aluminium gearboxes are available with double Viton sealing rings with stainless steel and with protective caps. In addition, drive shafts, output shafts and hollow shafts made of stainless steel can be attached as an option. The waves are made of AISI 316L. As additional accessories, components made entirely of stainless steel, such as torque arms and feet, are available for VFZ transmissions. The worm gears of the VFZ series are also available as clutch gearboxes. With the installation of a motor input clutch, a wide variety of motor sizes can be mounted on a gearbox. Of course, you also get our VFZ aluminum worm gear with attached electric motor as VFZ aluminum worm geared motors. Extensive technical details can be found in our downloadarea. VFZ Schneckengetriebe zeichnen sich besonders durch ihre Lebensdauer sowie ihre enorme Beständigkeit gegen Korrosion aus. You would like to buy a VFZ wormgearbox made of aluminum or you are interested in a VFZ worm gearmotor? Don’t hesitate to contact us – We are happy to help! You are interested in one of our products? Then get in touch with us!